No, not Columbia, South America, but the feminine symbol for America, Columbia. 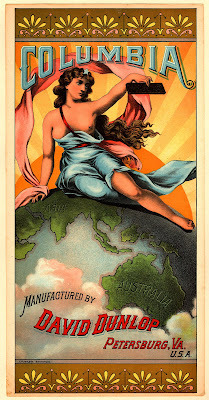 Here she dominates the world and offers chewing tobacco. The symbolism should be obvious, and although it wasn't thought of that way at the time, America, that is, Columbia, is offering mouth cancer or at least horridly bad breath and stained teeth to the world. Sort of like in the Garden of Eden, when the beautiful Eve offered the apple of knowledge which would so impact the world resulting in paradise lost. Show them a pretty woman in a provocative pose and they'll buy anything.